A Via Ferrata is a protected climbing route equipped with steel cables, ladders and other fixed anchors like suspended bridges and wooden walkways. It allows people to climb vertical walls, walk on ledges and reach the peak of mountains. Via Ferrata is an intermediate activity between hiking and climbing. It means iron trail in Italian and the first trails were built during World War I by the italian army to reach difficult peaks and establish observation points to monitor the enemy’s position and movement. It is only since 1990 that it became popular in France and you can now find a lot of new routes in mountainous regions. A via ferrata set is used to attach your climbing harness to the steel cable that runs along the trail and secures your progression. It allows you to reach challenging summits without advanced climbing skills. The via ferratas we propose are for everyone above the age of 8 years old and can be adapted to your level and desires. You will enjoy the thrill of climbing vertical walls with unique landscapes in the background and your friends and family members to share the experience with. 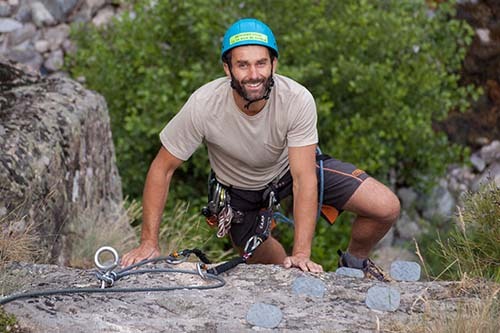 All the via ferratas are guided by qualified and certified instructors and include the technical gear: via ferrata set, helmet, harness, pulley and belay/rappel device depending on the route. Each participant needs to bring a bottle of water, something to eat, a pair of sneakers/trainers, sunglasses and sunscreen, a vest and a small backpack. If you want to make a reservation, ask a question or get more information on our activities, you can contact us by calling us at +33 7 83 82 61 22 or by writing a message using the contact form below.